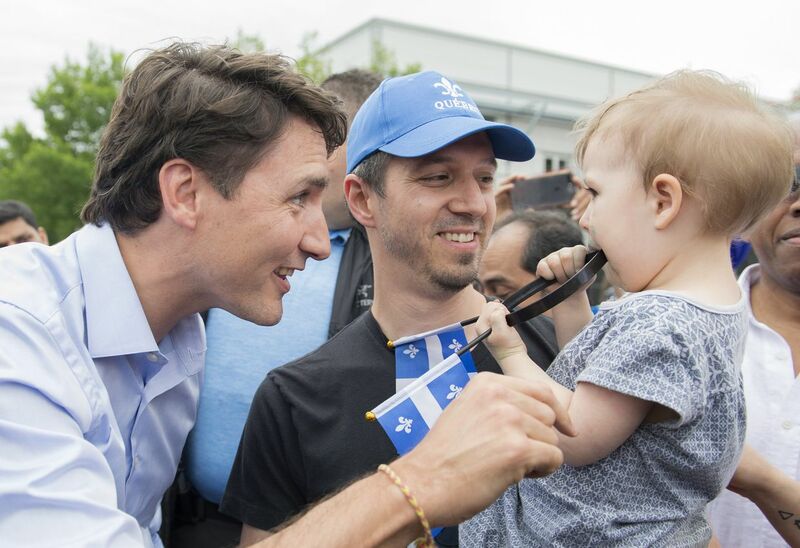 Prime Minister Justin Trudeau greets a man and a young child at St. Jean Baptiste Day festivities in Montreal. Justin Trudeau is the most popular federal leader in Quebec – and the most unpopular. 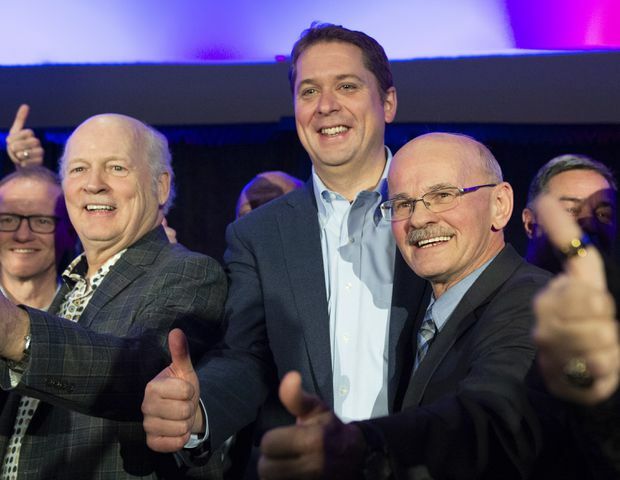 According to a new Léger poll, the Prime Minister scores high in both categories, showcasing how, after more than three years in power, he cuts a polarizing figure in the province that will be a key battleground in the next federal election. Overall, the poll results illustrate the Liberal Party’s ongoing strength in Quebec, which has a large contingent of pro-Trudeau voters and where the support of anti-Trudeau voters is divided among the opposition parties. However, the poll also suggests the other parties have room to grow if they tap into the disenchantment with the Liberal government and Mr. Trudeau between now and the Oct. 21 general election. The province is at the centre of the Liberal re-election strategy, as the party hopes that winning new seats in Quebec would offset potential losses in Alberta, Ontario and New Brunswick. With 47 per cent of Quebeckers having a positive impression of Mr. Trudeau, the federal Liberals can dream of improving their standings in the province from their current 39 out of 78 seats, pollster Jean-Marc Léger said. Liberal ministers have been criss-crossing Quebec in recent weeks making announcements, with a heavy emphasis on projects that create jobs such as infrastructure spending. The party is working hard to recruit candidates in winnable ridings, including more women, hoping to add recognizable new voices. With 45 per cent of Quebec having a negative impression of the Prime Minister, however, the Liberals could be at risk if one of the opposition parties can harness the anti-Trudeau vote, Mr. Léger added. The pollster predicted a hard fight in ridings outside Montreal and Quebec City between the Conservative Party and the Bloc Québécois, which are both targeting French-speaking, Quebec-first voters. Recent questions about the involvement of the Prime Minister’s Office in a legal case against SNC-Lavalin Group Inc., a major engineering firm headquartered in Montreal, could affect Liberal fortunes in the province. Many people in Quebec favour the idea of a negotiated settlement that would limit damage to the company. However, despite the efforts of some members of the Prime Minister’s Office, the government has not intervened in the prosecution of the company on charges of bribing Libyan officials between 2001 and 2011. The Conservatives have been taking a nationalist tilt in the hopes of creating a new coalition of voters similar to the one that helped Brian Mulroney’s Tories sweep the province in 1984. For example, they support the provincial government’s idea of transferring income-tax collection to Quebec, and greater powers for the province over immigration. Environmental policy and the fight against climate change are shaping up as key issues in Quebec, with the Bloc attacking federal support of the oil industry in the western provinces. The Green Party does not have a strong foundation in Quebec, but could have an impact on voting day, as they survey shows its leader, Elizabeth May, is second to Mr. Trudeau in terms of generating a positive impression, with a score of 37 per cent. The NDP has been struggling in Quebec. After taking 59 seats there in 2011 and 16 in 2015, the party is unsure it can keep its foothold under the leadership of Jagmeet Singh. Even though he has been leader since 2017, Mr. Singh is still unknown to 39 per cent of Quebeckers. Of the respondents who have heard of Mr. Singh, 59 per cent have a negative view. “The way things are going, the NDP risks being eradicated in Quebec,” Mr. Léger said. Pierre Nantel, an NDP MP from a suburban Montreal riding, is urging his party to steal a page from Québec Solidaire, an activist, nationalist and left-wing party that won 10 seats – in Montreal, Quebec City and university towns in the province – in the recent Quebec election. The party managed to mobilize the youth vote in Quebec by putting its ecological policy at the centre of its platform. “The NDP must find inspiration in these progressive militants who, in Quebec, mostly find a home in Québec Solidaire. These progressives have a number of priorities, none of which is more important than the environment and the fight against climate change,” Mr. Nantel said. Quebec Premier François Legault greets Prime Minister Justin Trudeau in Sherbrooke, Que., in January, and Conservative Leader Andrew Scheer in Quebec City in November. According to the Léger poll, the federal Liberal Party is in first place in Quebec, with 39-per-cent support. The Conservatives and the Bloc Québécois are tied for second at 21 per cent, followed by the NDP at 8 per cent and the Green Party at 5 per cent. The People’s Party of Canada, led by former Conservative MP Maxime Bernier, stands at 6 per cent, with the potential to eat into support in the Conservatives’ stronghold in the region of Quebec City. Quebec Premier François Legault has made it clear he will press all parties to propose policies that appeal to Quebeckers and are in sync with his government’s nationalist agenda. His government is seeking federal funding for large projects, including a bridge or a tunnel near Quebec City, as well as $300-million to deal with the recent influx of asylum seekers from the United States. “I don’t intend on endorsing one political party at the expense of others. But I plan on insisting on getting answers on infrastructure, on immigration, on compensation for asylum seekers, on the plan for a single income-tax return administered by the Quebec government. Then it will be up to Quebeckers to assess the platforms of the different parties," he said. 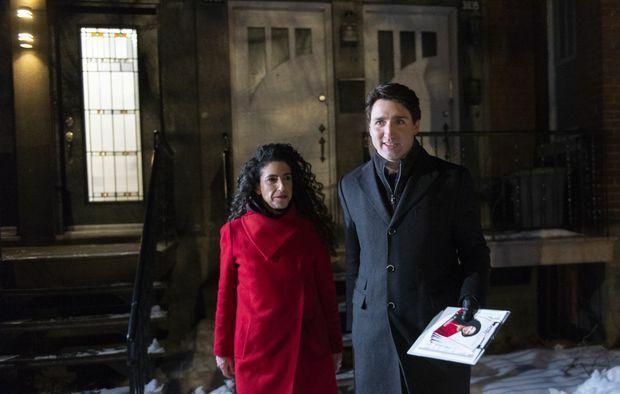 Trudeau campaigns for a by-election in Montreal's Outremont riding with candidate Rachel Bendayan, on Jan. 28, 2019. With their support heavily centred in the Montreal area, the Liberals are favoured to win a by-election on Feb. 25 in Outremont, which they lost to the NDP in a stinging defeat in 2007. 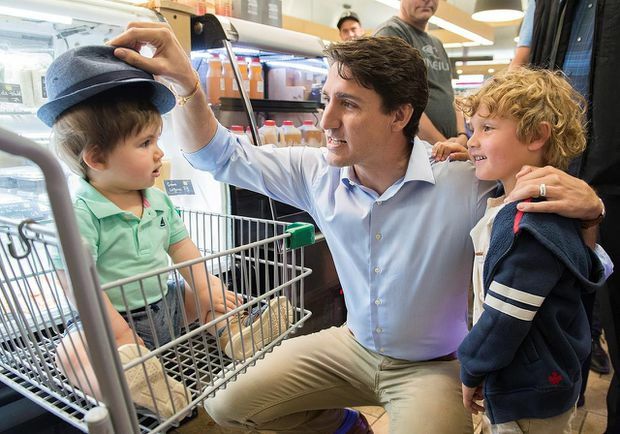 Trudeau greets a young boy at a market in Drummondville, Que., on St. Jean Baptiste Day, as his son Hadrien, right, looks on. The Liberals have momentum in many swing ridings that went to New Democrats with minuscule margins in 2015. Alexandre Cusson, the mayor of Drummondville, which is in an NDP riding, is contemplating a Liberal run. Rimouski mayor Marc Parent has publicly urged local NDP MP Guy Caron to switch to Team Trudeau. Still, the Liberals are vulnerable in Quebec, where 45 per cent of voters have a negative opinion of Mr. Trudeau, ahead of Mr. Bernier at 43 per cent, Mr. Singh at 31 per cent, Conservative Leader Andrew Scheer at 26 per cent and Ms. May at 15 per cent. Since coming to power, Mr. Trudeau has faced frequent attacks in Quebec’s right-wing media, notably on talk radio and in the opinion pages of the Journal de Montréal, about his approach to immigration and multiculturalism, deficit spending and the legalization of cannabis. “The question now is whether it will be the Bloc or the Conservatives that will rally the opposition to Justin Trudeau,” Mr. Léger said. The Conservatives are targeting the Bloc’s 10 seats and are hoping to steal two Liberal seats in Quebec City and another one to the north in Lac-St-Jean. As part of their strategy, the Conservatives are relying on the support of Michel Gauthier, a former Bloc leader who is now stumping for Conservative candidates. Former Bloc leader Michel Gauthier, left, looks on as Scheer gives the thumbs-up with Beauce candidate Richard Lehoux, in St-Elzear, Que., on Nov. 3, 2018. The Bloc is coming off a tumultuous year in which it nearly splintered over leadership issues. The sovereigntist party’s new leader, Yves-François Blanchet, a former provincial politician and television pundit, has generated a positive impression since taking the job in January. Still, 61 per cent of respondents do not know him, which was the highest level among federal leaders. In coming months, Mr. Blanchet and the Bloc are planning to attack the Liberals on the environment, including Ottawa’s purchase last year of the Trans Mountain pipeline expansion project in Alberta and British Columbia. “Do you really think that Quebeckers want to pay for a portion of this pipeline, based on the hypothetical possibility that there is a market in Asia for that product?” Mr. Blanchet said in an interview. “The Quebec model, in terms of the environment, is not compatible with the Canadian one." Mr. Léger cautioned that Quebeckers have been extremely unpredictable in recent votes. In the 2008 federal election, the Bloc took the biggest share of seats. Three years later, there was the NDP “Orange Wave,” followed in 2015 by a Liberal majority in the province. He said Quebeckers’ voting intentions will likely evolve as they get to know the leaders of the other parties. When the pollsters asked about issues facing the country, respondents saw Mr. Trudeau as the best leader to promote Canada’s place on the international stage, with a 26-point lead over Mr. Scheer (38 per cent versus 12 per cent). Mr. Trudeau is also in the lead over the Conservative Leader in terms of fostering job creation and economic growth (13 points), reducing taxes (6 points) and effectively managing public finances (3 points). Mr. Trudeau trails his Green Party counterpart by eight points on protecting the environment (23 per cent for Ms. May versus 15 per cent for Mr. Trudeau). In terms of defending Quebec’s interests, Mr. Trudeau (19 per cent) trails Mr. Blanchet of the Bloc (22 per cent) by three points. In its poll, Léger also asked questions to find out how Quebeckers perceive Mr. Trudeau, who has represented the Montreal riding of Papineau since 2008. More than 60 per cent of respondents see Mr. Trudeau as friendly, modern and dynamic. Still, he ranks below 40 per cent for competence or his ability to keep his promises and understand ordinary people. “He has a strong image, he is a celebrity in that he is seen as being sympathetic, modern and dynamic, but also in the sense of being seen as superficial. He has the pros and cons of being seen as a star,” Mr. Léger said. The Léger poll was conducted on the internet between Jan. 25 and 28. With 1,026 respondents, the poll would have a margin of error of plus or minus 3.06 per cent had it been conducted with a probability sample. applies rather well or rather poorly to Justin Trudeau?